WordPress has been one of the most preferred CMS sites if you wish to promote your business and make people aware of your services and drive a revenue in return. Thus, it becomes a choice of millions of industry makers and business owners. Although WordPress websites have endless benefits, one outcome could be that your website becomes slow. And if you don't take the precautions, you might end up with a sluggish website. Whenever a customer visits your website for the very first time, you get only a few seconds to gain their attention. It's all in your hands whether the customer will stick to your website or will quit right away. Simply because nobody has enough time to wait for the website to load, they will simply switch to a new website. At this point, not only will you lose your permanent and new customers, but you will also lose ranking of your website because Google gives a lower ranking to the websites which are slower to load. If you wish to work upon the speed and performance of your website, the foremost step is to identify the reasons which cause your website to slow down. Isn't it? So, here are the main causes which make your WordPress site to slow down. Web Hosting: If your web hosting server is not configured properly, it might result in lowering the website speed. WordPress configuration: If the website is not serving cached pages, it overloads your server, and resulting in the website to slow down or even crash entirely. Page Size: The images which are not optimized for web results in reduced speed. Bad Plugins: Using a poorly coded plugin can be a reason which lower downs the speed. External Scripts: The scripts including ads, font loaders, etc can end up in reducing your website speed. 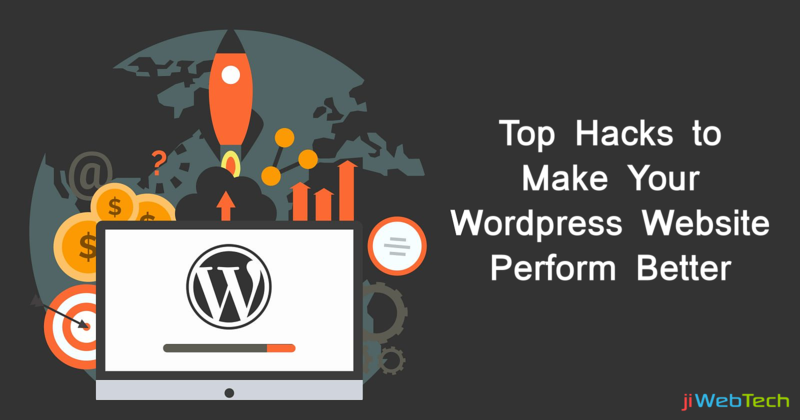 Now that you are aware of the reasons behind reduced speed and performance, it's time to learn the tips and ways to enhance the speed and performance of the WordPress websites. Are you ready? Let's get a closer view! Using the Best Plug-ins: Using a good plug-in makes sure that whenever a user searches anything on the website, it doesn't have to go through the entire website. Rather the plug-in will copy the page information when the user makes a search and present the required and exact outputs. Choosing Right Images: Using heavy files and images reduces the speed, so you can optimize the images to increase the speed. But remember, too much of compression might affect the image and video quality, so you need to get assistance from a reliable vendor. Selecting Homepage Content: Preparing attractive content, articles, and blogs is a must for gaining customers attention. But, what to show on the homepage of the blog or website needs to be planned and distributed accordingly as putting complete content on one page itself might put load on that page and thus lowering the website speed. Optimizing Website Design: No doubt, there is an endless number of website themes available in the market, and you can select the one you like. But, don't forget, choosing the wrong theme can directly reduce the website speed too. So, get your business requirements clear and go for the best suitable themes for your website. Using a CDN: Using a CDN(content delivery network) can directly impact the website speed and performance of your website. It speeds up the loading time for all your customers. Whenever a customer will visit your website, they will be served with the faster and quicker results. Optimize the WordPress database: Once you are using WordPress, your database might have a lot of information which is not useful to you anymore. And keeping this data over the database will reduce the performance. So, you need to optimize your database and remove the unnecessary data from it. Wondering about where to get a web hosting vendor which can entirely take care of your website at all times? You can count on us! jiWebTech offers the most trustworthy and reliable hosting services for your website. Discuss your requirements with us and get the best suitable hosting services from us. Have any other queries? Get in touch with us at any time and get instant response from our team of experts!